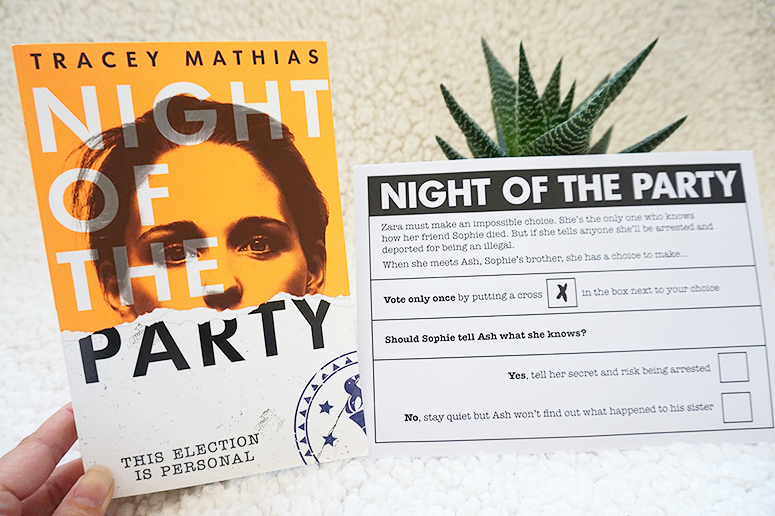 You may remember I was a part of the blog tour for super intriguing YA political thriller Night of the Party a few weeks ago, in which I interviewed author Tracey Mathias about what inspired the idea behind her novel, her writing research, and why you should be reading the book right now. I also shared a giveaway to win one of five signed copies, so if you haven't checked out that post yet make sure you do so now (the competition is open until 31 May). And if Tracey's excellent interview answers haven't already convinced you to pick up the book, definitely read my full review below! Night of the Party is an eerily timely young adult novel set in a post-Brexit Britain led by a nationalist party who forces everyone who is not BB (British Born) to return to their country. Protagonist Zara was born in Romania but grew up in the UK and so for her to have to return to a country she doesn't know seems incomprehensible yet it's the heartrending reality. As soon as I started reading Zara and Ash's story I was unable to put this book down. Tracey Mathias has created a world that while fictional is really not very far off from where we are today, which makes it as terrifying as it is realistic. A nationalist party taking political control or Britain and forcing so many of its citizens to leave what is their true home is the scenario so many Brexiteers voted and hoped for, so what's to say that this book isn't telling a future five or ten years down the line? That's a very scary thought. Zara's journey throughout the novel was a horrifying one (especially to a European citizen living in the UK like myself) but hugely eye opening too to the horrors that really don't sound all that far from our current reality. The fear she feels with every interaction she has outside of her immediate family, and the conditions she experiences along the way are inhuman, yet it could become a reality. Terrifying. And despite this she risks everything to help her friend Ash. A true testimony to her character. Night of the Party is timely, thought-provoking and utterly terrifying. This is the political thriller we need right now to open our eyes and serve as a warning for what can happen if we as a collective don't make the necessary steps for change to where our society is heading. Zara can be any teenager living in Britain today; she is the girl you see every morning on your way to work, a friend from school, someone who lives a few doors down on your street... In this book she's given an impossible choice that will rip her away from her friends, her life and the only home she's ever known. Let's make sure that this remains a fictional reality only. Night of the Party is published by Scholastic and you can get your copy now from Foyles or your own preferred retailer.